The NFL is “inelastic for demand,” Young said, meaning that nothing — including poor officiating — can deter a significant percentage of fans and corporate sponsors away from the most popular game in the country. It’s the primary reason the NFL has held steady in its labor impasse with regular officials: There is no sign that enough of the sporting public cares to make it a priority. But the NFL/referee dispute is partly about “pay for performance” – the NFL wants to bench referees who botch calls (the money issues are trifling as a fraction of NFL revenue). This suggests the NFL does actually care about good officiating. This makes them weak in the face of the current officiating. They should cave sooner rather than later. Were the replacements refs really that bad from an empirical perspective? A few blown calls are going to occur in any game with any set of refs. After all, no system of rule enforcement is going to work perfectly. 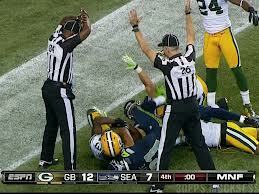 It was certainly a problem for the NFL that games were significantly longer with the replacement refs. Even if this does not drive away any viewers from games, it reduces the amount of advertising per minute that TV stations end up selling, and thereby drives down the value of the game rights. The NFL’s broadcast partners/clients were certainly hurt by the replacement refs, and this is one reason why the NFL needed to settle.